Water and other liquids evaporate at different rates. These rates are influenced by the temperature, humidity, air flow and surface area of the liquid that is exposed to the air. While a liquid's evaporation rate may vary with conditions, the evaporation rates of different liquids are stable relative to each other. 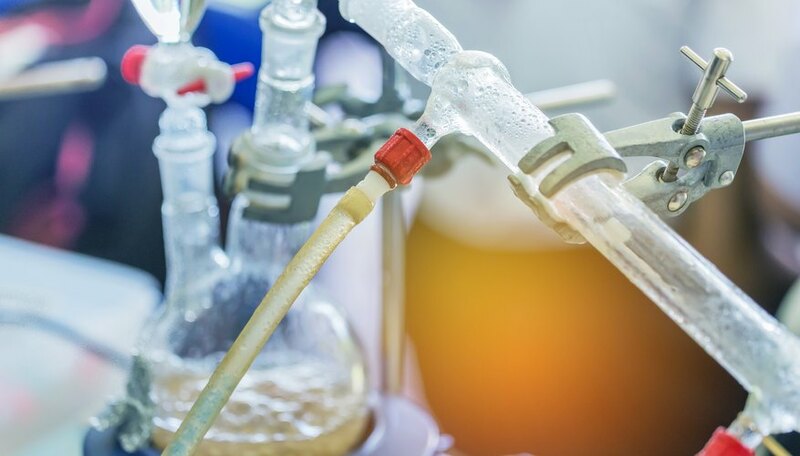 For instance, if identical amounts of ethanol and water are kept in identical open containers and exposed to identical environmental conditions, the ethanol will always evaporate faster. Calculating the evaporation rate for a given set of conditions is a simple thing to do. Record the environmental conditions that are occurring while you perform this evaporation rate calculation. Are you outside or inside? What time is it? What is the temperature, barometric pressure and relative humidity? What is the average wind speed? Is it sunny or cloudy? You will find it easier to do your measurements inside so that you can control the conditions. Fill your graduated cylinder to the 500 mL mark with the liquid for which you wish to calculate the evaporation rate. Start timing with your stopwatch after you have done so. Periodically check the level of the liquid in the graduated cylinder. When it has dropped a measurable amount, stop the stopwatch and record the time and the volume reading from the graduated cylinder. For example, after one hour the liquid might have decreased to the 495 mL mark on the cylinder. Subtract the new cylinder reading from the original reading. This reflects the volume of liquid that has evaporated. For example, 500 mL - 495 mL = 5 mL. Divide the volume of liquid that evaporated by the amount of time it took to evaporate. In this case, 5 mL evaporated in an hour: 5 mL/hour. Remember that your calculations will not yield an "absolute" evaporation rate for the substance; the rate will change with conditions. Banas, Timothy. "How to Calculate Evaporation Rates." Sciencing, https://sciencing.com/calculate-evaporation-rates-5997022.html. 30 April 2018.